In recent years there has been growing interest in collecting antique Florida soda bottles. This interest has produced guide books for some of the most collectible regions of Florida, including Pensacola, Jacksonville, Key West, and recently Southeast Florida. These guide books pretty much cover the state's largest historic cities. Unfortunately, there has been little or no information available for Tampa, one of Florida's largest cities. After years of collecting Tampa bottles, I figured that if no one else was going to make a guide I might as well. So here it is, the first ever collector's guide to Tampa soda bottles. 194 soda bottle variants described in detail with colors, manufacturing dates, embossing details, etc. 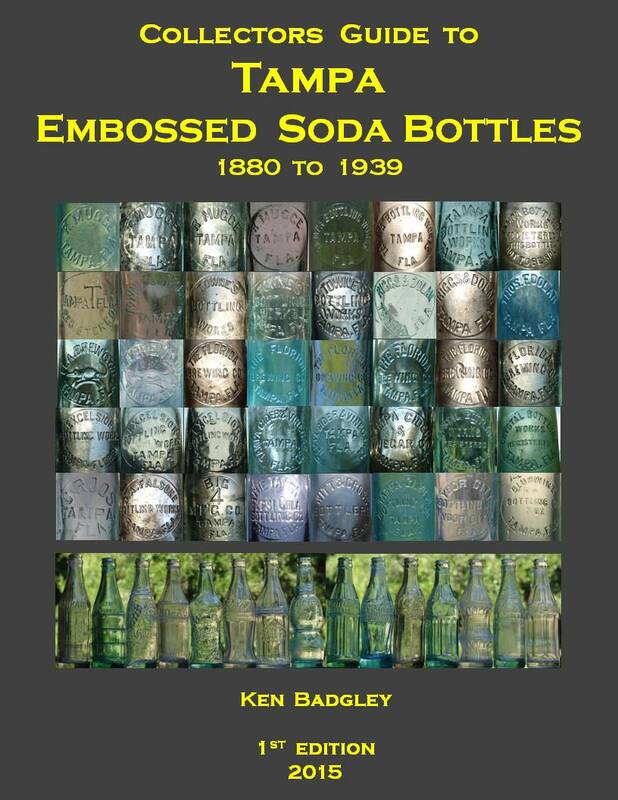 This guide lists all known embossed soda bottles made for bottlers in the city of Tampa including Ybor City up until 1939, grouped by bottling companies and in order of the company's founding date. Any information I could find is listed, including old city directories, trade magazines, and Sanborn maps. The bottles themselves usually tell us when they were made and this usually confirms most of the data I have compiled, while also bringing up some unusual questions and mysteries as well. A breakdown of all known variants of each company's bottles is presented in a spreadsheet form listing all details about each bottle. The back of the guide features a foldout bar chart that has all known bottling companies with embossed bottles listed in order of founding and ending dates, all broken down by year. Any evidence of a company's existence is shown in this bar chart, providing an overview of the evolution of the soda bottling industry in Tampa. The price/value guide lists all known Tampa bottle sales on eBay for the past 10 years, broken into three conditions in order to get a better idea of bottle values, and tallied up for an average price. Even if you are not interested in this region of Florida, this guide book is written in a way that it could be used to further your knowledge of the evolution of the soda industry and its bottles for any large town in America. Price: $30.00 including FREE SHIPPING via USPS Media Mail. All books are very well packaged using rigid inserts.